Objective To explore whether the incidence of end-stage renal disease (ESRD) in type 1 diabetes (T1DM) was lowered over time, and how the baseline characteristics and risk factor management during follow-up were associated with the incident ESRD. Research design and methods An observational cohort study was performed in 1014 patients with T1DM diagnosed from 1961 to 1999, who were admitted to the diabetes center. The incidence of ESRD up to 2010 and the effect of risk factors, including annual mean glycated haemoglobin (HbA1c) and blood pressure, were investigated. Results During a mean follow-up of 19.3 years, with 88.3% follow-up rate, the incidence of ESRD was significantly lower in T1DM diagnosed in 1985–1999 than in 1961–1984 (0.8 vs 5.0 per 1000 person-years, p<0.0001), which was not precluded by preceding death. Multivariate Cox regression analysis indicated that the former group (vs the latter) was associated with a significantly reduced risk of ESRD independent of baseline variables of age, duration and gender (p<0.01). The continuous variable of year of T1DM diagnosis remained significant after adjustment for the above variables plus baseline proteinuria and retinopathy (p=0.02). Time-dependent Cox regression analysis indicated that ESRD was associated with annual mean HbA1c (p<0.01), systolic blood pressure (p<0.001) and baseline proteinuria (p<0.001), followed by continuous variable of year of T1DM diagnosis (p=0.09). Conclusions Our data indicate that incidence of ESRD is decreasing over time, coinciding with enhanced glycemic and blood pressure controls. The incidence of ESRD in recently diagnosed T1DM appears to be much lower than previously reported ESRD incidence. We report that incidence of ESRD of type 1 diabetes has been decreased over time in Japan. Time-dependent Cox regression analysis revealed that ESRD incidence was associated with HbA1c, systolic blood pressure, baseline proteinuria and year of diagnosis of type 1 diabetes. The improved incidence of ESRD as compared to other cohorts is discussed. Diabetic nephropathy is the leading cause of end-stage renal disease (ESRD), and is responsible for more than 40% of new cases of ESRD in the Western world and Japan; thus, the risk of ESRD in T1DM remains high.1 ,2 Prevention of or delay in the development of ESRD is a pre-requisite to maintain the quality of life and to reduce economic burden, especially for individuals with youth-onset type 1 diabetes mellitus (T1DM). The incidence of ESRD due to diabetic kidney disease appears to vary substantially between centers and ethnicities.3 Matsushima et al4 reported, in 1995, that Japan had a markedly high incidence of ESRD in patients with T1DM diagnosed from 1965 to 1979 before the age of 18 years; the incidence per 1000 person-years was 5.5, which was 2.4-fold higher than that in the population in the USA. Thereafter, several epidemiological observational studies for the incidence of ESRD in T1DM have been published. From a nationwide population-based cohort study in Sweden, the incidence of ESRD in patients with T1DM diagnosed between 1977 and 1983 was 0.53 per 1000 person-years, while a secular trend was not investigated.5 From a national registry system in Finland, the incidence of ESRD in T1DM was clearly shown to have decreased over the past four decades.6 However, while several multiple changes in therapy and lifestyle have occurred during the past decades that may have led to the improvement in the incidence of ESRD over time, the incidence of ESRD in T1DM remains inadequately analyzed after implementation of stricter controls of BP, lipids and glycemia, along with treatment advancements. It is important to report the incidence of ESRD in other ethnicities, and to explore the effect of the year of T1DM diagnosis on incident ESRD, together with modifiable risk factors. In this study, we performed a large-scale prospective long-term observational cohort study with youth-onset patients with T1DM diagnosed from 1961 to 1999 in Japan, with an aim to test the hypothesis of whether year of T1DM diagnosis is associated with incident ESRD. We explored whether the incidence of ESRD in T1DM decreased over time, and how the baseline characteristics and risk factor management during the follow-up were associated with incident ESRD. The study included 1014 participants with T1DM (372 males, 642 females) who were diagnosed before the age of 30 years from 1961 to 1999, and attended a tertiary diabetes care clinic—the diabetes center of Tokyo Women's Medical University (TWMU)—consecutively from 1961 to 1999. To test the hypothesis of whether the year of T1DM diagnosis was associated with incidence of ESRD, patients were divided into two groups by the median of the number of participants, that is, diagnosis of T1DM from 1961 to 1984 (group A, n=529) and from 1985 to 1999 (group B, n=485). Those with T1DM who did not continue their visits for more than 1 year (n=263) were not included, because these patients only visited, at most, once or twice for the purpose of specialist consultation. Patients who already had ESRD, developed ESRD within the 1 year after the registry (n=18), or developed ESRD due to non-diabetic renal disease (n=3), were excluded. There was a systematic reconstruction in the TWMU, in which participants with T1DM who visited the Department of Pediatrics before 1987 were included in the records of the diabetes center and those after 1988 were not included. T1DM was diagnosed in accordance with the Japan Diabetes Society (JDS) criteria, as previously reported.7 In brief, T1DM was defined as being prone to ketosis with acute onset and requiring insulin therapy within 1 year of diagnosis. Two or more physicians belonging to the JDS classified the disease type. Assessments of serum C-peptide and antiglutamic acid decarboxylase (GAD) antibody levels were performed after these tests became available, to help support the diagnosis of T1DM; however, the patients who were GAD antibody-positive, but did not require insulin therapy for more than 1 year, were excluded in the present study, from a clinical point of view. The study was performed in accordance with the tenets of the Helsinki Declaration II. Blood pressure (BP) was measured at each visit by sphygmomanometer with an appropriate-sized cuff in the sitting position after resting for more than 5 min. Glycated haemoglobin (HbA1c) was measured by the mini-column method (Isolab (Quik-Sep), Akron, Ohio, USA) in 1980–1981, by the glycospec method (Abbott (ABA-200), North Chicago, Illinois, USA) in 1982 and by the high performance liquid chromatography method (HPLC; HA8120, HA8121, HA8131, HA8150, HA8160, HA8180: ARKRAY, formerly Kyoto Daiichi Kagaku, Kyoto, Japan) from 1983 to date. The values gathered using the mini-column method (x1) and the glycospec method (x2) were converted to HPLC (y) values using the formula (y)=((x1)+0.302)/1.179 (r=0.990), (y)=((x2)+2.151)/1.332 (r=0.855), and all values were expressed asHbA1c values (as % and mmol/mol) certified by the American National Glycohemoglobin Standardization Program. Patients visited the clinic monthly or bimonthly, and the average values of BP and HbA1c of each year were used for analysis. Urinary protein was measured by Albustix (Miles-Sankyo, Tokyo), and proteinuria was defined as three of four consecutive tests being positive in the absence of menstruation, urinary tract infection or other known non-diabetic renal disease. Diabetic retinopathy was diagnosed after pupillary dilation by ophthalmologists. Cardiovascular disease included coronary artery disease, ischemic stroke, and peripheral artery disease. Usage of renin angiotensin system inhibitor (RASI) or statin at baseline and follow-up, and current smoking at follow-up, were obtained through the patient records. ESRD was defined by the initiation of renal replacement therapy, that is, hemodialysis, peritoneal dialysis or kidney transplantation, or death from diabetic kidney disease due to refusal or no access to dialysis. The time was calculated from the date of registration at the diabetes center until either the date of ESRD, death or the end of observation (December, 2010). For participants who were censored, the final date of visit, being alive and free of ESRD, was used for analysis. For patients who moved to other cities/hospitals (n=89), a questionnaire was sent to the doctor who took care of the patient. Data are expressed as the mean±SD unless otherwise stated. The year of T1DM diagnosis was analyzed both categorically (two groups, A and B), and as a continuous variable (per year). For comparisons between two groups, the unpaired Student's t test for continuous variables and χ2 test for categorical variables were used. The incidence density was presented as the number per 1000 person-years, based on the ratio of the observed number of patients experiencing the event (cases) to the total person-years of exposure (at risk). For patients who developed an event (ESRD or death), the contribution of person-years was accumulated until the year of onset of the event. Those who remained free from an event contributed to person-years until the end of follow-up (December 2010). Those who had no ESRD and who discontinued visits contributed to person-years until the last clinic visit. A comparison of the incidence with the rate ratio (RR) was performed using the χ2 test, and the normal approximation after log-transformation was used for the calculation of CIs. The cumulative incidence was plotted using the Kaplan-Meier method with the log-rank test statistic, according to years after registration, duration of T1DM, and postpubertal duration of T1DM (from 11 to9 years in males and females, respectively). Univariate and multivariate Cox regression analyses were used to compute the HRs and 95% CI to assess the effects of covariates on the onset of ESRD. The year of T1DM diagnosis (group A and B), gender, baseline age and duration of diabetes, were used as covariates in model A, and baseline proteinuria and retinopathy were added to model B1. Model B1 was modified to model B2 by replacing the categorical group for year of T1DM diagnosis (A and B) with year of T1DM diagnosis as a continuous variable. Time-dependent Cox regression analyses were applied to model C1, including annual mean HbA1c and systolic BP as time-dependent variables and model C2 used year of T1DM diagnosis as a continuous variable. For patients who were registered before 1980, the first measured value of HbA1c in 1980 was used as the baseline value of HbA1c because the HbA1c was not available before 1980. To explore the cross effects of HbA1c and systolic BP as time-dependent variables on incident ESRD, time-dependent Cox regression analysis was used, adjusted by the continuous variable of year of T1DM diagnosis, gender and baseline status of age, duration, proteinuria and retinopathy as covariates. For this analysis, patients were divided into high/low groups of HbA1c and systolic BP by the median values of HbA1c and systolic BP obtained from the entire follow-up period, and the group with low HbA1c and low systolic BP was used as a reference. All statistical analyses were performed using SAS software, V.9.4 (SAS Institute, Inc, Cary, North Carolina, USA). Table 1 shows the clinical characteristics of the 1014 participants, according to the year of T1DM diagnosis. While gender, age and HbA1c at baseline were similar between the two groups, group B had significantly shorter duration, less proteinuria and retinopathy, and lower systolic BP than group A. The ESRD and death status as of December 2010 was confirmed in 895 patients (88.3%), and the remaining 119 patients were censored (table 1). The ascertainment rates were similar between group A and B. Group B had significantly lower mean values of HbA1c and systolic BP during follow-up, and lower proportion of RASI and statin use. As shown in figure 1A, cumulative incidence (95% CI) of ESRD at 25 years of observation was 11.7 (9.5 to 13.9)% in group A and 3.0 (2.9 to 3.1)% in group B (p<0.001 by log-rank test). Table 1 shows that, as compared with group A, group B had significantly lower incidences of ESRD, all-cause death, and ESRD or death (RR (95% CI) 0.16 (0.06 to 0.37), p<0.0001; 0.47 (0.25 to 0.83), p<0.01; 0.34 (0.20 to 0.56), p<0.0001, respectively). Of the 44 patients in group A and 4 in group B with proteinuria at baseline, 24 (55%) and 3 (75%) developed ESRD, respectively. No patient died due to ESRD because of refusal or no access to dialysis. 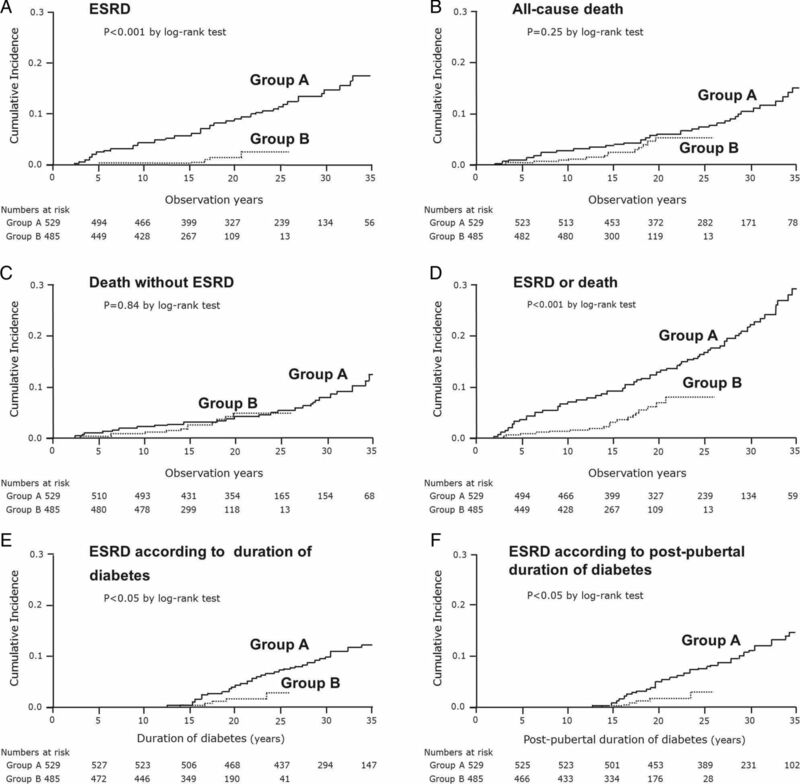 Since death without ESRD did not differ between the groups (RR (95% CI) 0.63 (0.32 to 1.18), p=0.13), the lower incidence of ESRD in group B was unlikely to have been confounded by preceding death. There were five patients who developed cardiovascular disease (4 in group A and 1 in group B) before developing ESRD. Cumulative incidence of ESRD according to the duration of T1DM and post-pubertal duration of T1DM are plotted in figure 1E, F, showing identical results to those of figure 1A. Cumulative incidence of (A) ESRD, (B) all-cause death, (C) all-cause death without ESRD and (D) ESRD or all-cause death in patients with T1DM diagnosed in 1961–1984 (group A) and 1985–1999 (group B), by years of observation. The cumulative incidences of ESRD were plotted according to (E) duration of T1DM and (F) post-pubertal duration. ESRD, end-stage renal disease; T1DM, type 1 diabetes mellitus. Figure 2 shows the annual mean HbA1c and systolic BP change of each patient as trajectories, for patients who developed ESRD in the right panel, and for those who did not in the left panel. Patients who developed ESRD exhibited very high HbA1c levels for the first 10 or more years followed by the decline, with sustained or increasing high systolic BP levels throughout. 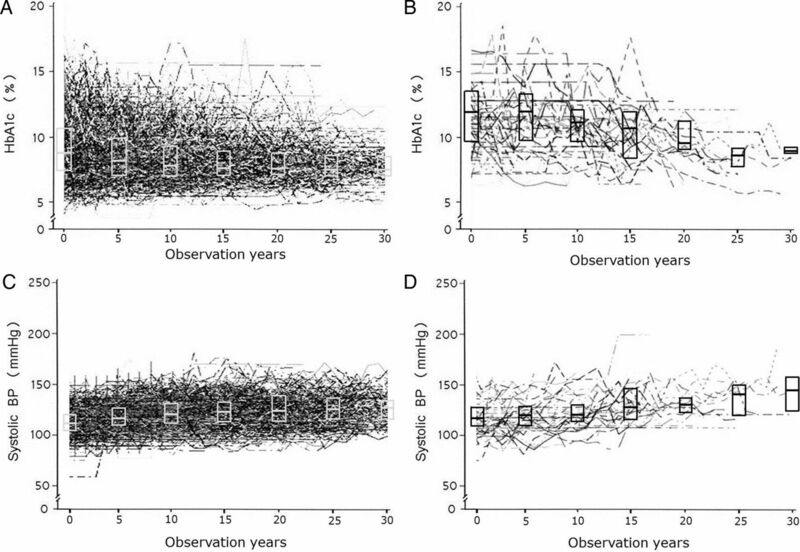 Trajectories of HbA1c changes and systolic BP changes by years of observation. (A and C) Patients who did not develop ESRD; (B and D) those who developed ESRD during follow-up. Medians and IQRs are depicted. BP, blood pressure; ESRD, end-stage renal disease; HbA1c, glycated haemoglobin. Table 2 shows the univariate and multivariate Cox regression analyses exploring the effect of variables on the onset of ESRD. The year of T1DM diagnosis, as a categorical variable, was significantly associated with onset of ESRD independent of the effects of gender, age and duration at baseline. After adjustment for baseline proteinuria and retinopathy, year of T1DM diagnosis, as a categorical variable, became non-significant (model B1), but remained significant as a continuous variable (model B2). The time-dependent variables of HbA1c and systolic BP were both significantly associated with onset of ESRD, and the effect of year of T1DM diagnosis, as a categorical variable, was cancelled out (model C1), while the year of T1DM diagnosis, as a continuous variable, showed borderline significance (model C2). The cross effects of high/low HbA1c and high/low systolic BP indicated that, compared to the low HbA1c/low systolic BP group as a reference, high HbA1c/high systolic BP, followed by low HbA1c/high systolic BP, exhibited significantly higher risk for onset of ESRD (HR (95% CI) 10.82 (1.43 to 81.8), p<0.05; 8.41 (1.11 to 63.6), p<0.05, respectively), whereas high HbA1c/low systolic BP was not significant ((HR (95% CI) 5.47 (0.06 to 45.3), p=0.12). In this study, we tested the hypothesis of whether incidence of ESRD in T1DM is improved by year of T1DM diagnosis. Based on 1014 patients, with a mean of 19 years of observation and 88% follow-up rate, the incidence of ESRD in recently diagnosed T1DM (diagnosed in 1985–1999; group B) was significantly lower than that in group A (diagnosed in 1961–1984). The significantly lower incidence in group B was not precluded by preceding death. Lower systolic BP in group B, both at baseline and during follow-up and lower HbA1c during follow-up, may reflect the advances in treatment with new techniques, including self-monitoring of blood glucose, long-term monitoring of glycemic control by HbA1c, basal-bolus insulin treatment and the use of insulin pen devices, matched by improvements in BP control with aggressive antihypertensive treatment, including RASI. These have likely contributed to the improved incidence of ESRD, while less complicated clinical features at baseline in group B also reflected the calendar year effect. It should be acknowledged in the present study that duration of T1DM at baseline varied; some patients were registered at onset of T1DM, and some were registered long after the T1DM onset. Therefore, the ascertainment of patients included both, incident and prevalent cases. However, this study design is necessary for such observational epidemiological studies, in which very long-term follow-up and large-scale patient populations are required to observe the onset of proteinuria and development of ESRD. At baseline, 44 patients with proteinuria were included in group A and 4 in group B, and 24 (55%) and 3 (75%) of them developed ESRD, respectively. Time-course observations of albuminuria excretion rates were unable to be included in this study; however, remission of proteinuria may have occurred in some patients, because recent reports have indicated that remission of persistent proteinuria was observed in T1DM22 and T2DM,23–26 due to the advancement in treatment for aggressive BP and glycemic control. The remission of proteinuria is associated with preservation of renal function and reduces risk of ESRD.22–26 We believe that the present time-dependent Cox regression analysis, accounting for these important factors, supports the improved secular trend of ESRD over time. There are some limitations to the present study. In Japan, every patient undergoing dialysis therapy is registered with the Japanese Society for Dialysis Therapy, and the cost is covered by the national public health insurance system; however, specific information on individuals and registered data cannot be used for epidemiological research. Second, because the diabetes care and treatment for modifiable risk factors at the diabetes center, a tertiary diabetes clinic, may be better than that generally received by patients, the outcomes in our study may underestimate the risks elsewhere.7 However, the treatment advances with new techniques are universal. Third, there were some missing data, such as baseline proteinuria and retinopathy and RASI use at follow-up, although these were in less than 5% of the cohort. Smoking data were only obtained in 80% of patients; however, the proportion of smokers at follow-up was approximately the same between groups A and B. Fourth, use of RASI at follow-up was higher in group A than in group B, which is contrary to the known renal protective effect. Higher BP levels and use of RASI observed at follow-up in group A may reflect the poorer health and increased comorbidities of patients requiring RASI. Higher use of statin at follow-up in group A may be due to the same reason. Fifth, the first measured HbA1c value in 1980, in patients registered before 1980, was used as the baseline HbA1c value, because it was not available before 1980. Glycemic control before 1980 was likely poorer than that in 1980; thus the risk may be underestimated. Finally, we should acknowledge that patient characteristics including age at onset of T1DM, duration of T1DM, and complications, were different between the groups, partly because participants who visited the Pediatric Department were not included after 1988 due to systematic reconstruction. The strength of this study is that a large number of patients were followed from the age of 19 to 20 years for a mean of 19 years, with 88% of patients followed until the end of the study, and the remaining patients were confirmed to be free of event up until their last visit. The present findings may be noteworthy, because research on the incidence of ESRD in T1DM diagnosed after 1985, including the annual changes of glycemic and BP values over time, has been scarce. In conclusion, our data indicate that incidence of ESRD is decreasing over time, coinciding with enhanced control of modifiable risk factors, such as glycemia and BP. The incidence of ESRD in recently diagnosed T1DM appears to be much lower than previously reported. Ms Megumi Shinji, STAT COM, Inc, Tokyo, Japan, is greatly acknowledged for her skillful technique in performing statistical analysis. The authors thank the following medical doctors for their cooperation in this survey; Aoki K, Deguchi A, Emoto N, Fujii Y, Goshima E, Goto T, Hashimoto N, Hirano T, Honjo H, Hori K, Ikema T, Iwase S, Kageyama M, Kawai Y, Kamata T, Kamoi H, Kanazuka A, Kasahara T, Kashiyama A, Katayama K, Kato M, Katsumori K, Maeda H, Maruyama H, Maruyama T, Masuzaki H, Matsui J, Minami M, Miura Y, Miyakawa T, Miyamae M, Morimoto N, Morioka M, Nagai Y, Nagaiwa J, Nakata K, Narita T, Narumiya M, Nimura T, Nunome H, Odagiri R, Okada A, Okada K, Okuguchi F, Omura E, Ono Y, Sakai Y, Sato J, Satsuta M, Sawamura Y, Shimizu Y, Shiragami F, Sugawara M, Suzuki D, Suzuki S, Takahashi S, Takahashi Y, Takeda A, Takesue M, Tanaka H, Tojo K, Tokunaga T, Tomonaga O, Tomura R, Ueno H, Ujihara N, Waguri M and Yagi K. ., FinnDiane Study Group. Competing-risk analysis of ESRD and death among patients with type 1 diabetes and macroalbuminuria. J Am Soc Nephrol 2011;22:537–44.
. Markedly increased renal disease mortality and incidence of renal replacement therapy among IDDM patients in Japan in contrast to Allegheny County, Pennsylvania, USA. Diabetes Epidemiology Research International (DERI) U.S.-Japan Mortality Study Group. Diabetologia 1995;38:236–43.
. Association between glycemic control and adverse outcomes in people with diabetes mellitus and chronic kidney disease: a population-based cohort study. Arch Intern Med 2011;171:1920–7. Contributors TO, HY and YU designed the study. TO generated data. TO, HY and YO performed the statistical analysis. TO and HY equally contributed to the study design, statistical analysis, interpretation of the data and drafting of the manuscript. YO takes responsibility for the statistical methodology and for organizing and performing the multivariate analysis. All the authors critically reviewed the manuscript. TO is the guarantor of this work and, as such, had full access to all the data in the study, and takes responsibility for the integrity of the data and the accuracy of the data analysis.